Classic Horween leather billfold for carrying your most prized guitar picks. 4 card pockets, 4 pick slots, and center cash pocket to store bills. Vegetable tanned leather interior, black exterior. Handcrafted by Matt Codina in USA. 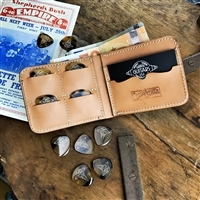 Classic Horween leather billfold for carrying your most prized guitar picks. 4 card pockets, 4 pick slots, and center cash pocket to store bills. Vegetable tanned leather interior, black exterior. Handcrafted by Matt Codina in USA.